Sunrise Rotarians Kathy Duley and Connie Fisher co-Chair the Mayor's Cup T-shirt committee. In addition to being sold at various establishments around town, many fellow Sunrise Rotarians volunteered to sell T-shirts at the Farmers Market, the City's Fourth of July Parade, the Jumping in July Concert at the Strand sponsored by Sunrise Rotary, at Trinity Park during the Mayor's Cup Festival and all day at the Naked Turtle during the Mayor's Cup Regatta. 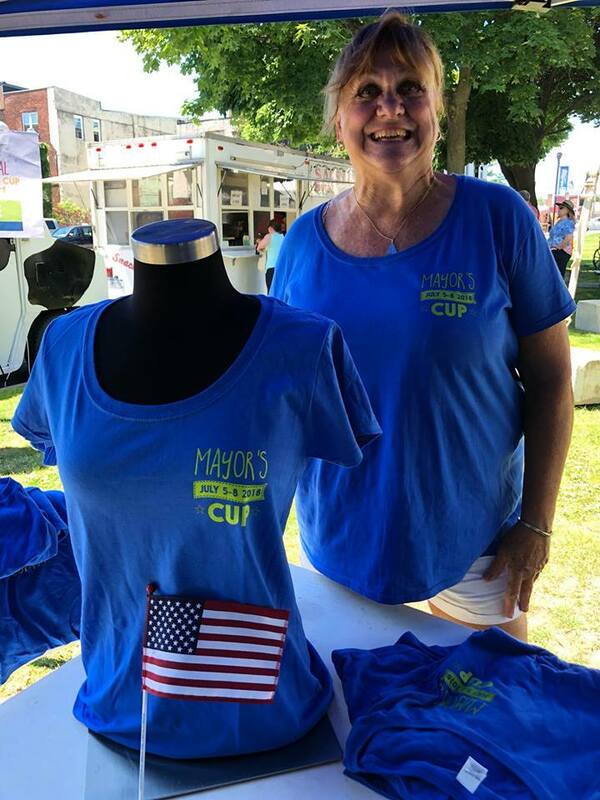 Proceeds from the sales of Mayor’s Cup t-shirts help Plattsburgh Sunrise Rotary support community-based projects, such as the Sunrise Rotary Pavilion at Wilcox Dock, and the Sunrise Rotary Gazebo at the Samuel D. Champlain monument. In fact, Sunrise Rotary raised over $25,000 for the universally accessible Max Moore Memorial Treehouse on the Saranac River Trail in Plattsburgh.